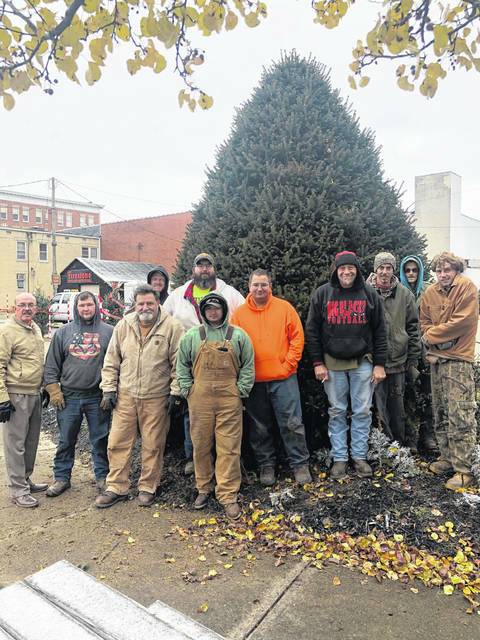 Mayor Brian Billings and Street Commissioner Randy Hall, along with employees with the city’s street department, are pictured along with Point Pleasant’s official Christmas tree in Gunn Park. Street department staff helped move the tree into its new home ahead of this Friday’s lighting ceremony. POINT PLEASANT — This year’s official City of Point Pleasant Christmas Tree came from close to home, in fact, it used to live on Parrish Avenue. It now lives in Gunn Park after being donated by Adam Lewis. Street department employees worked this week to relocate the tree which will be decorated just in time to be lit up this Friday evening, during the annual tree lighting ceremony. The ceremony immediately follows the city’s Christmas parade which begins at 6 p.m., also this Friday. Line up for the parade is at 5 p.m. at the former Central Elementary School. Royalty from the Mothman Festival will be collecting bags of dog and cat food for the Mason County Animal Shelter from parade participants who wish to contribute. As for the ceremony, it will consist of performances by members of the Point Pleasant Junior/Senior High School bands and choir. The PPJHS Band is under the direction of Tim Huffman; the PPHS Black Knight Band is under the direction of Ben Loudin; the PPJ/SHS Choir is under the direction of Ethan Bartlett. Pastor Jim Kelly from Trinity United Methodist Church will provide a holiday message and Pastor Bobby Patterson will sing a Christmas song titled “Strange Way to Save the World.” A community Christmas Carol will also be led by Patterson. Attendees will then count down to the tree lighting with the themed trees for the Light of Christmas tree project also illuminating Gunn Park. City officials thanked Lewis for donating the tree this year.